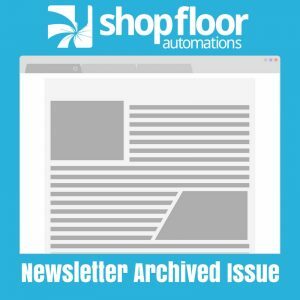 The following is an archive of our January/February 2016 Shop Floor Automations Newsletter. Please note that the newsletter sent out had a typo of the date “January/February 2015” in the title, but this email was sent out February 16th, 2016. Join us on April 14th at 12:00PM PST, to learn how machine monitoringand data collection can make predictive maintenance a reality in your operations. discuss their software applications and integration options. and asset management strategy can soar. simple touch screen buttons can replace these traditional methods. display work instructions, or trigger many more customizable functions. process to be implemented with no install needed! how you can further automate your machine shop. Is Your Shop Ready for El Nino? The recent weather trends have proved problematic to many machine shops. machine shops can’t afford to lose CNC communication. is a simple solution to keep productivity on schedule during unforeseen problems. NTMA Member Discounts, Benefits and Meetings! together, collaberate and learn from each other. Are Your Machines Actually Cutting? that recently began utilizing data collection software in order to improve efficiency. of what is actually happening on the shop floor. Read the full article HERE.